For many attorneys, eDiscovery is a process to be abused or ignored. However, the state bar ethics committees are finally getting around to requiring familiarity if it impacts your practice. Since everything is electronic these days, it doesn’t matter what area you practice in, eDiscovery impacts you. So unless you’re willing to expend the time necessary to get caught up, you’re going to need help. That means hiring the right eDiscovery expert. Whether a third-party contractor or in-house employee, your eDiscovery expert should be an integral part of your practice. Do you really need to hire an expert? Yes, because as attorneys, we simply don’t have the ability to do it all ourselves. Whether it’s through intentional acts or ignorance (or being intentionally ignorant), attorneys have a really poor track record with eDiscovery. Why is that? After all, eDiscovery is about obtaining facts and information that is relevant to a case. It’s really no different than any other discovery. 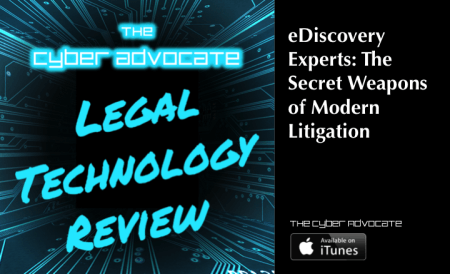 There are two theories that I discussed with Andy Webb in this podcast: 1) lack of familiarity with eDiscovery, and 2) legal gamesmanship. When I asked Mr. Webb about lawyers and competence with eDiscovery, he said that, in his experience, it’s not a lack of interest, but a lack of awareness that’s most frequently the problem. Most attorneys have never taken the time to learn or understand exactly what can be obtained in eDiscovery, or how to obtain it. However, once shown how eDiscovery experts, armed with analytics tools and aggregation software, can turn 500,000 pages of documents into 1,000 relevant documents, a new world opens up. Is this really true? Are attorneys avoiding eDiscovery simply because they don’t want to admit they’re embarrassed about what they don’t know? If that’s the case, it’s not a good indicator for our profession. Moreover, the lack of eDiscovery being used broadly in state-level litigation indicates that attorneys are willing to weaken their own clients’ case rather than hire an eDiscovery expert. The other intriguing suggestion by Mr. Webb is that the refusal to engage in eDiscovery is about making sure that metadata isn’t available to the other side. As he described it, this is a deliberate refusal to include eDiscovery in the discovery scheduling conference. The result is taking metadata away from all parties in the case. If the other side asks for native files, then you point to the order and say that you’re not obligated to produce documents in that form. However, you’ve also taken the benefit of the metadata completely away from your client as well. And for no other reason than to deprive your opponent of the benefit of metadata you’re not even sure exists. Is this gamesmanship, or just another horribly detrimental way attorneys refuse to admit they need help from an eDiscovery expert. Probably a little of both. We get it, eDiscover experts are great. But when should I bring them in on a case? Whenever any new matter walks in the door, that’s when. Your eDiscovery expert should be consulted at the beginning of any matter, whether in pre-litigation or not. Waiting to involve your eDiscovery expert because the case isn’t “big” enough, or because your client suggests he doesn’t want to bear the expense, is a mistake. In fact, by involving your eDiscovery expert early, you can potentially save your client a TON of money. By involving your eDiscovery expert early in the process, you and your client are both made aware of the data that might be available. More importantly, your expert has a basic understanding of the case and can start figuring out where the data is and what tools will be needed. One of the biggest potential problems with Discovery is that, for the most part, the data remains in your clients’ hands. Even if your eDiscovery expert is ultimately given access to the data, your client really needs to understand how important it is to maintain that data. Not only can your eDiscovery expert help explain what data must be preserved, and why, but they can also explain how the data needs to be preserved. With you in the room with your client and your eDiscovery expert, all of you have input on the best method and manner for collecting all the relevant data kept on your clients’ servers and computers. With knowledge of the case, your eDiscovery expert can advise you about who should be consulted first at your client’s company (Andy Webb says he always goes to the IT people first – they know where the proverbial bodies are buried!). Getting together and agreeing on a plan for collection at the beginning of your representation is particularly critical, especially if you have a client who is generally reluctant to give you access to his files. By making it clear from the outset that they will be required to allow collection of electronic data, you can nip those objections from the start. Imagine the same client, whom you told that electronic discovery likely wouldn’t be necessary, when the court orders them to produce a complete mirrored copy of their servers to the other side. To the majority of attorneys I work with, eDiscovery is usually avoided under the pretense of saving money. However, the number of cases that I’ve worked on involving a large number of documents, particularly electronically stored documents, tells another tale. By the time the litigation really heats up, there are only two options: 1) break your promise to save money and painstakingly examine the documents by hand – running up a huge bill in the process, or 2) simply acknowledge (to yourself) that you don’t actually know what was produced. The first is likely to piss off your client, the second is like playing Russian Roulette. However, getting your eDiscovery expert involved right from the start has numerous financial benefits, too. First, they know what tools to use to get the information. As Mr. Webb discusses in the podcast, most eDiscovery tools will assemble and categorize your data. But which tools will cross reference data from a laptop with data from a cell phone? Which program is going to be necessary to truly capture all of the data in social media posts? These tools will save you time and money, and will make sure that you have access to all of the essential information available. Why leave your case up to gamesmanship when all it really takes to make sure that you’ve got access to all the information your opponent has is hiring the right eDiscovery expert? When you get documents produced from electronic files, they’re usually in either PDF or TIFF format, right? If the other side really splurged, they might even run an OCR on them so that you can search through text. Hell, they might even produce some of the metadata in similar format. There’s a reason they went to all that trouble – it’s not as good as native format. First, the file sizes of the production increases exponentially, meaning it’s likely going to cost more, be more of a burden on your computer systems, and take more time to review. Second, regardless what metadata is produced, the native file version is likely to have more. Finally, by receiving the native file version, you can find out whether the metadata has been altered. Not likely with a PDF or a TIFF. We’ve all run into a situation where our go-to person for whatever wasn’t available. For some things, you’re willing to wait. For others, waiting isn’t even an option. What happens when you give your eDiscovery expert or vendor the biggest project you’ve ever had. More data, from more devices, and in more locations, than anything you’ve ever done. At the same time, you have your normal cases, which might not generate a ton of work for your eDiscovery expert/vendor. But this week, they generated just enough. Your vendor, who also only has 24 hours in a day and limited manpower resources, advises that you now have to pick which job gets done. Is there anyone else you trust to do the job? If not, start looking for a backup to your go-to vendor. What happens to the data you’ve given your eDiscovery vendor when the case is finished? At the very least, you should know. If you don’t then you absolutely need to download my Third Party Vendor Checklist and go through it completely. You’ve handed your client’s data over to a third-party, you are responsible for what they do with it. As Mr. Webb discusses in the podcast, the preferred situation is that any data retained by your eDiscovery vendor should be destroyed at the end of a case. Only you should retain a copy of the client’s data, if anyone does, and nobody else should have access to the work product generated by the vendor. Leaving potentially confidential data in the hands of a third-party vendor is already a security risk, why leave it there any longer than necessary?